The government will launch a "New Deal for Families"
Figures showing a 200,000 rise in UK children living in relative poverty last year have been described as a "moral disgrace" by Barnardo's. The children's charity said ministers were a long way from honouring a pledge to halve child poverty by 2010. 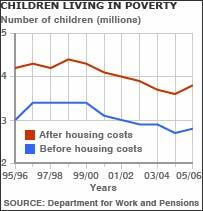 In 2005-6 3.8m children were in poverty - in homes on less than 60% of average income including housing costs. But Work and Pensions Secretary John Hutton said "considerable progress" had been made in ending child poverty. Shadow chancellor George Osborne said the figures, from the Department for Work and Pensions, were "depressing" and called for a new approach in tackling poverty. In the previous year the number of children living in relative poverty with housing costs taken into account was 3.6m. With housing costs not deducted from incomes the number of children living below the relative poverty line was 2.8m, up from 2.7m in the year before. The increases are the first recorded in six years; since 1998/99, 600,000 children have been lifted out of relative poverty. Work and Pensions minister John Hutton said: "We have made considerable progress against our historic goal to end child poverty in the UK." He added: "We need to go further towards what is a very tough goal to reach." But to reach their stated targets, ministers must now help lift a further 1.1 million children above the poverty line by 2010 - or 1.6 million after housing costs are included. Barnardo's chief executive Martin Narey said: "This is a moral disgrace. In 1999, we were all excited by the Government's determination to eradicate child poverty and, on the way, to halve it by 2010. "It is now clear that what they meant was that they intended, not to halve child poverty by 2010, but to reduce it a bit." Shadow chancellor George Osborne said: "Today's depressing figures show that poverty is increasing, inequality is rising, and the incomes of the poorest fifth are in decline." He called for an approach "based on social responsibility so that, alongside financial support through tax credits, it can focus on tackling broken communities, poor skills and family breakdown". The government said a rise in the number of self-employed people falling below the line contributed significantly to this year's rise. It hopes the launch of a new £150m child poverty strategy, which includes a programme to get parents into employment, will help the government hit its target. In a speech on Tuesday highlighting the Sure Start programme, Chancellor Gordon Brown said: "We will redouble our efforts to extend Sure Start to tackle child poverty to help mothers at that point in their lives where they are under great pressure with young children." The government says advisers can then consider the applicant's need for help with looking after their family. In last week's Budget, Mr Brown announced increases in benefits and tax credits aimed at lifting more than 200,000 children out of poverty. Save the Children's UK director Colette Marshall said: "This vital target is slipping dangerously out of reach. "It is only too clear that Gordon Brown's Budget announcements last week will not be enough to get the government back on track. "We must now see a sense of urgency from the government to make the target achievable."